Part 3 of a series on Rotterdam's efforts to become a sustainable and "climate-proof" city. The city and port of Rotterdam. 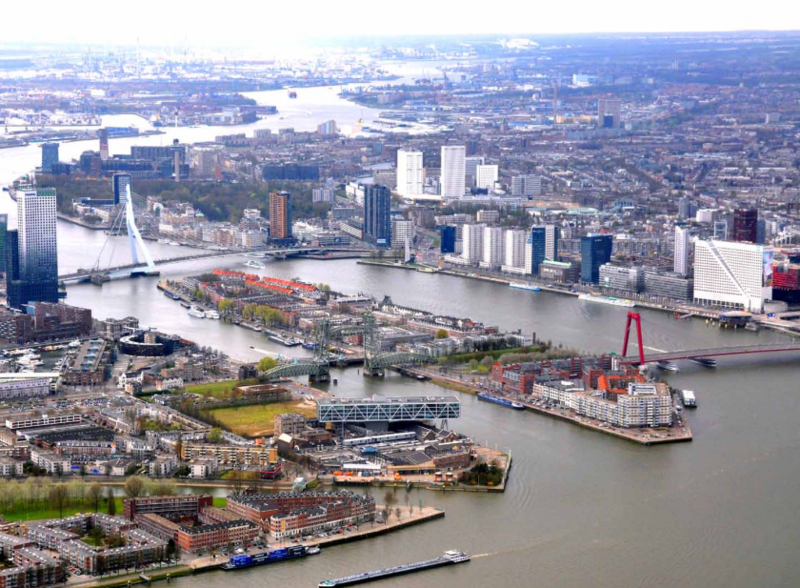 Rotterdam, the Netherlands--Can the city of Rotterdam cut its CO2 emissions in half by 2025? In order to succeed, the city will need to increase its production of renewable energy and expand its district heating network. The city is also striving to make its economy more energy efficient, and reduce vehicle emissions. 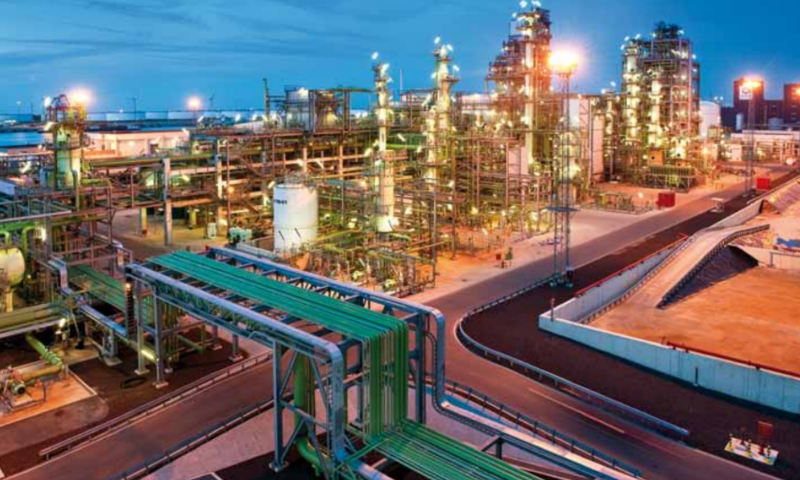 Rotterdam's industries and incinerator generate enough waste heat for a million households. This city of 630,000 thus has substantial potential for district heating to share residual industrial heat with homes and businesses. A company known as the Heating Company of Rotterdam collects heat from industries in the port and shares it with homes and businesses. Use of waste heat eliminates the need to burn fossil fuels for heat and results in a significant reduction of greenhouse gases, such as carbon dioxide and nitrogen oxides, thus improving local air quality and public health. The energy from the combustion of a single municipal garbage bag is enough to provide the heat for seven showers, officials say. 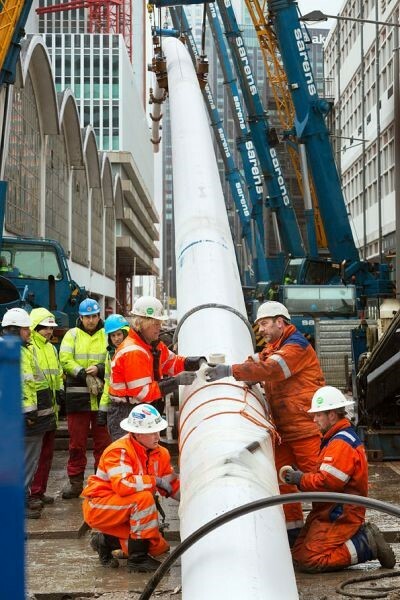 Slightly less than 20 percent of Rotterdam's homes are now on district heating. The city is committed to getting 40 percent of its residents on district heat by 2020 and aspires to have 50 percent connected to district heating by 2035, but that will be very challenging. The use of district heating is integral to Rotterdam's plan to eventually phase out natural gas and reduce carbon emissions. Its district heating system already avoids the emission of 182,000 tonnes of CO2 per year. To reduce natural gas, the city wants to increase the use of electricity for domestic residential uses and to use more rooftop solar panels. How The District Heating System Works. Heat produced by the city's waste incinerator and waste heat generated by industries in Rotterdam's port area is used to heat water. The hot water is then sent in underground pipes to provide homes, businesses, and institutions, such as hospitals, with reliable and affordable space heat and hot water. The district heating system is, in essence, a closed loop with two primary pipes. One supplies hot water. A second pipe then returns the water at a lower temperature to the industrial heat source where it is reheated before being piped back to users. The heating network is analogous to an electric grid, except that thermal energy can be recirculated. Rotterdam's district heating will be part of a larger project called The Heat Roundabout that will also include the city, its port, and the other municipalities in South Holland, such as The Hague, Delft, Westland, and Leiden. The city is investigating the possibility of making the heating network more sustainable by integrating geothermal heat into the system. By 2020, 350,000 homes will be connected to district heating along with about 2,500 acres of greenhouses in Westland and Oostland north of the port. The cost of building the district heating infrastructure has been about three billion euros. However the system will generate about twice as much in revenue from sales of the heat plus the value of the CO2 reduction and other social benefits. The greenhouses that receive district heat also utilize CO2 piped separately to them to promote plant growth. 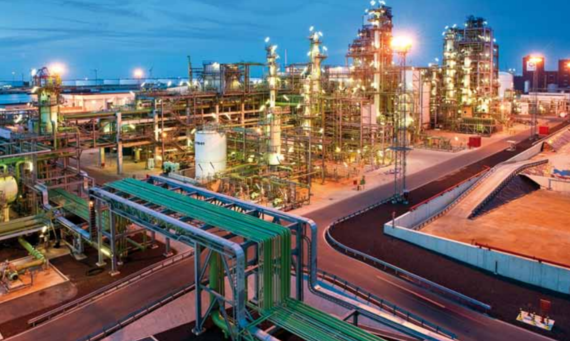 They previously produced their own heat and CO2 with natural gas-fired combined heat and power plants (CHP). Today, with the availability of district heating and the waste CO2 distribution system, their heat and CO2 requirements can be met without CHP plants. 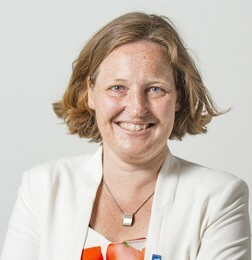 Astrid Madsen manages the city's district heating and cooling program and other aspects of Rotterdam's energy transition. Under a provision added to the Rotterdam Building Act in July 2007, if district heating is available in a part of the city where a new building is being built, the building must be connected to district heating. "New buildings are not the challenge, existing buildings are," Madsen said. Eighty to ninety percent of the buildings in Rotterdam in 2050 are already built, she points out. District heating can also provide reliable cooling services. The cooling is created when customers use district heat to run absorption chillers and generate cool air. The city is currently investigating the feasibility of setting up a cooling network. Rotterdam is not only working with other cities and its region to expand district heating, it is also active internationally. The city is part of an international DCH consortium known as Celsius, with four other municipal partners: London, Cologne, Genoa, and Gothenburg, and 20 other partners that include energy companies, research institutions, and universities. Together they form a network of over 50 cities, exchanging knowledge and experience. 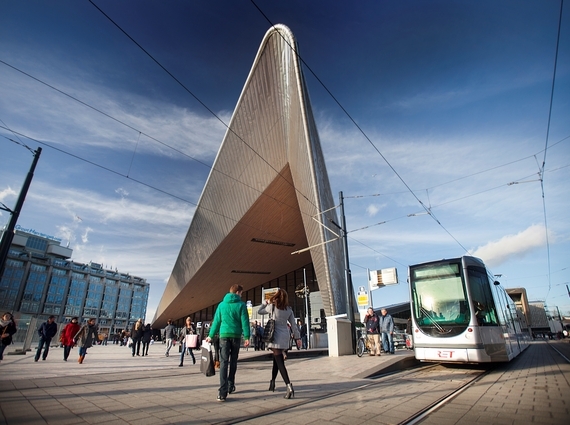 Rotterdam's public transport company, RET, currently uses clean renewable energy to power its trolleys and subways, and RET aspires to become the world's cleanest public transportation company. It plans to extend vehicles' range by capturing and reusing braking energy, a process known as recuperative braking. 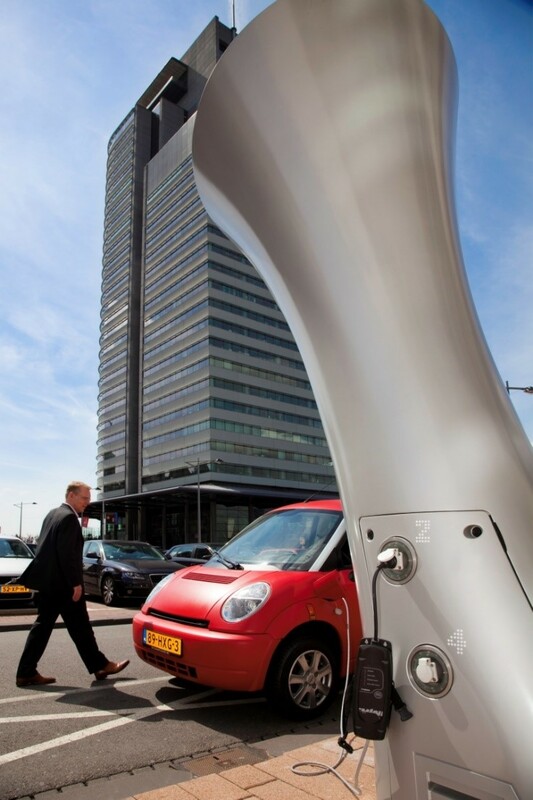 Through its Power Surge Program, Rotterdam is also strongly encouraging the use of electric cars, which reduces noise, carbon emissions, and fine airborne particles that damage people's lungs. "We're right in the middle of implementing a huge zone where polluting cars will no longer be allowed after January 1 ," said Paula Verhoeven, manager of the Rotterdam Climate Initiative. At the same time that the city is introducing its environmental zone, it is also encouraging demand for electric cars. "If you have an electric car, you get a charging point for free from the city," Verhoeven said. "When you talk to the public about CO2 emissions, it doesn't appeal to them very much," Verhoeven said. "But by focusing on air quality, it makes [public] acceptance higher." "We also have a subsidy in place to [encourage people to] replace their old car, buy a new one if they like, or they can get rid of their car altogether and just use public transport, which is excellent in the city," Verhoeven said. Through Power Surge, the city already provides 2,000 charging stations for EVs and plans to add 2,000 more within the next two years. The city offered free parking permits for the first 1,000 electric cars to register for Power Surge. The city also has specific goals for increasing the use of public transport and bicycles and for reducing urban noise. Among other things, it is investing in bicycle paths and bicycle parking areas. It also encourages car sharing through its Greenwheels and teleworking programs. Rotterdam also is promoting the use of electric bicycles and scooters, and pays owners of conventional scooters a fee for scrapping them. The city has a dozen public bicycle sheds with recharging stations for electric bicycles and scooters. Biodiesel fuels are being introduced for trucks and natural gas is being tried for inland ship traffic. Deltalinqs Energy Forum, a project of the city's main business association, is assessing the possibility of using hydrogen for vehicles at Port terminals and to fuel medium-sized, inner-city delivery vans. "Every year," Verhoeven explained, "we research what people value the most and think is most important about living in the inner city. Things like the attractiveness and the cleanliness of their environment, are very high on their list." Education. The city is committed to strengthening environmental education and participation in sustainability activities. The city operates on the premise that sustainability must be a guiding principle in education and research. The city thus brings sustainability issues to the attention of its colleges and universities and encourages a greater focus on sustainability issues in higher education curricula. The city runs a nature and environment education program for primary school children supported by a network of children's farms, as well as nature and environmental education centers with gardens, to bring children into contact with plants and nature. "Adults who were taught about nature and the environment when they were young better appreciate the value of nature, the environment and sustainability and are consequently better able to make considered choices," according to a major city sustainability report. Greenery. The city has thus for years been planting more trees, bushes, and other vegetation in the city. The extra greenery makes the city more attractive, cools the city during heat waves, and provides a noise barrier between people and traffic. The city also has a subsidy program for green roofs and green facades and is supportive of urban farm initiatives that make the urban food chain more sustainable. To set a good example for the municipality, the local government of Rotterdam and the Mayor fuel their vehicles with biofuels. Lighting. Among other measures, Rotterdam replaced conventional traffic lights at 240 intersections with energy efficient LEDs, resulting in an energy saving of 60-70 percent. Rotterdam plans similar energy savings by lighting public spaces with LEDs. 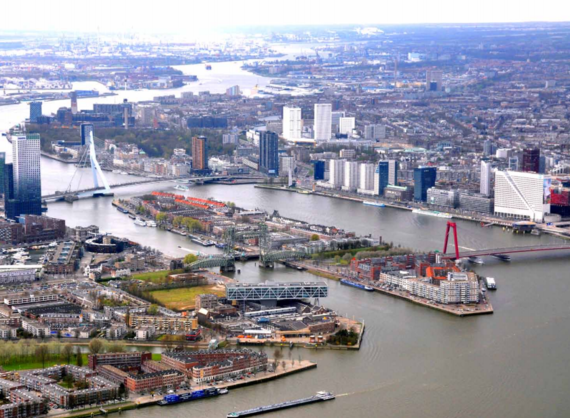 To learn more about how Rotterdam is implementing its climate change and sustainability plans, see Part 1 of the series, "Rotterdam, Striving To Be Green, Downplays CO2 Targets," and Part 2 of the series, "Rotterdam Strives for Competitive, Liveable Low-Carbon Economy". Additional articles about similar activities elsewhere in Europe can be found at http://www.huffingtonpost.com/author/johnjberger1-422. John J. Berger, PhD. (www.johnjberger.com) is an energy and environmental policy specialist who has produced ten books on climate, energy, and natural resource topics. He is the author of Climate Peril: The Intelligent Reader's Guide to the Climate Crisis, and Climate Myths: The Campaign Against Climate Science, and is at work on a new book about climate solutions.